What would you get if you threw a bike computer and a GoPro into a blender? If you are lucky you might end up with something cool like the MiniWing Camile. This clever gadget will record GPS positioning, speed, altitude,and other trip data, along with high-resolution video with a wide angle of view. MiniWing is a startup based in Hangzhou, China. They got noticed when they introduced their easy to use A380 quadcopter at this year’s CES. They are now making their mark with the Camile R100 for the cycling market. When the Camile R100 showed up at the office, we thought Apple had sent us something 🙂 Note the design esthetics of the packaging, the attention to “unpacking” experience, and overall Apple-esq look of everything. It is not hard to imaging it sitting on the shelf of the local Apple Store. The Camile R100 module is tiny, super light (6.2 cm x 4.35 cm x 1.6 cm, 2 ounces), and completely self-contained (internal battery, flash storage, camera, electronics). There is a round button on top and two rectangular buttons on the side opposite the lens. On the bottom of the module is a mounting plate. 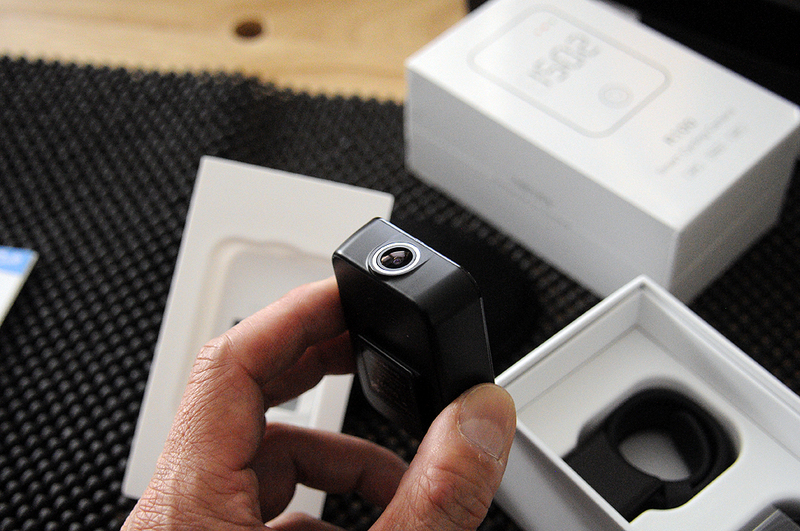 The video camera can capture video at various resolutions (1080p/30 fps, 720p/60 fps, VGA). It can also take photos at intervals between 5 and 60 seconds and then combine them together to form a Time-Lapse video, handy for those stretches of the look-alike scenery. The wide-angle lens (140º) and built-in electronic image stabilization (EIS) make sure all the action is captured without the shakes. 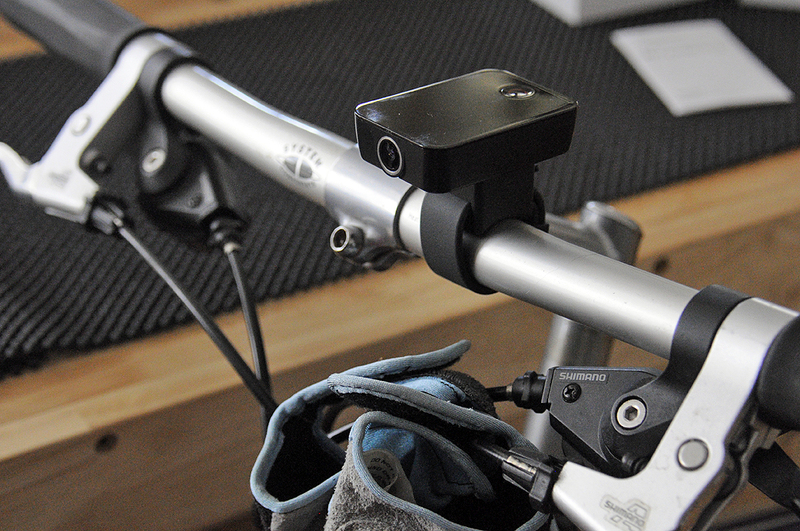 Included with the module is a mounting bracket that attaches to the handle bar of the bike the way a watch would onto a person’s wrist. The camera module “clicks in” with a positive feel and we are pretty sure it will not dislodge regardless of how vigorous the terrain. 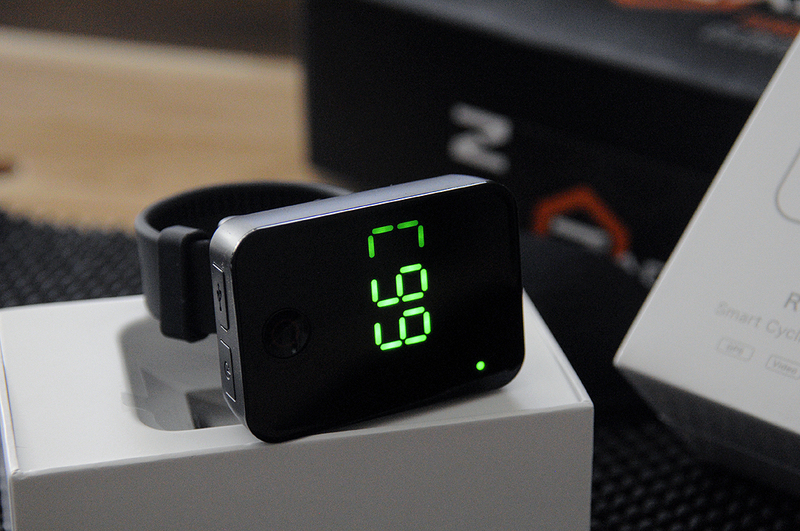 The top of the module hides a bright alpha-numeric LED display and colored indicator lights. 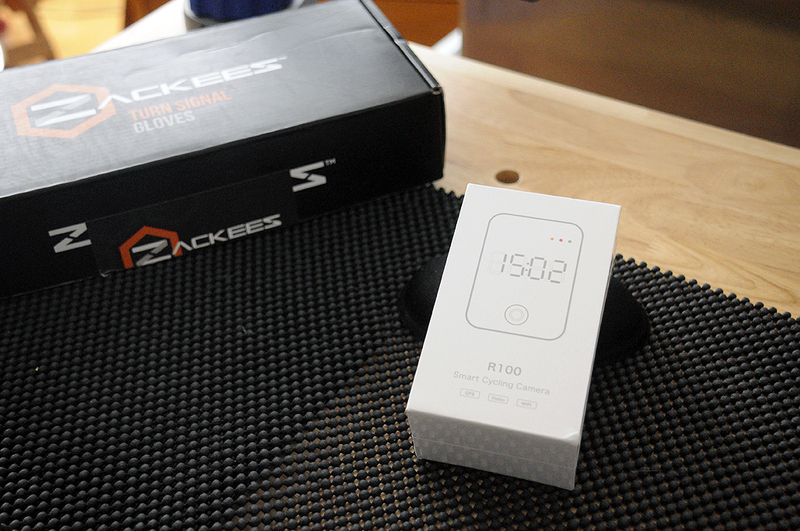 The LED screen will display the speed, time, and trip mileage. The recorded video footage can be transferred via a wifi connection or USB. We’ll have more to say about about the UI in the FirstUse writeup. 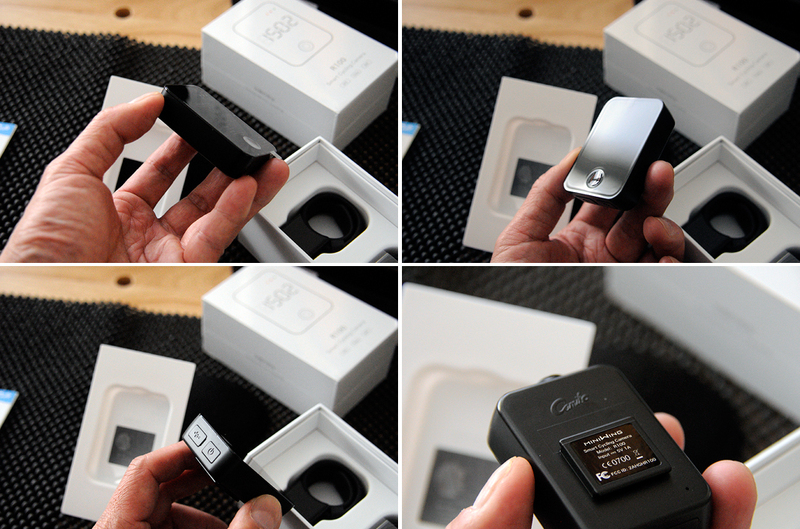 Inside the Camile is a rechargeable Lithium-ion 1350mAh which can record 3 hours of video after charging for an hour. 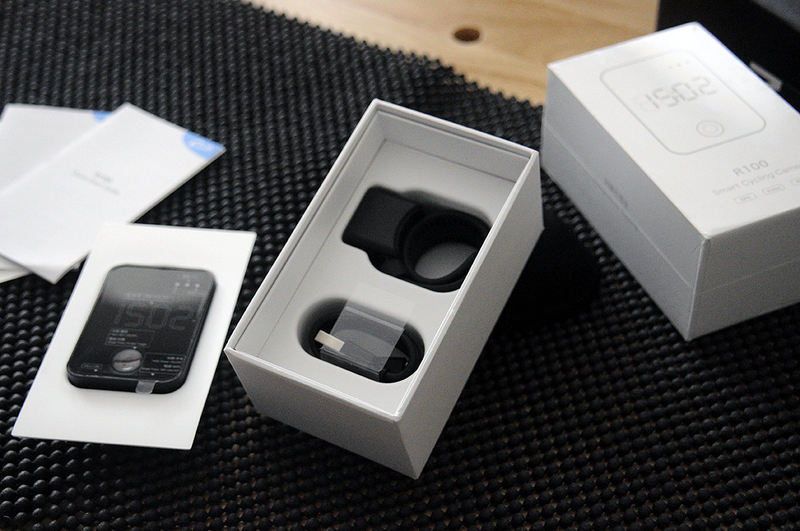 A micro-USB cable is included in the package and will work with any standard USB plug. Installing the mounting bracket for the Camile was quick and intuitive. 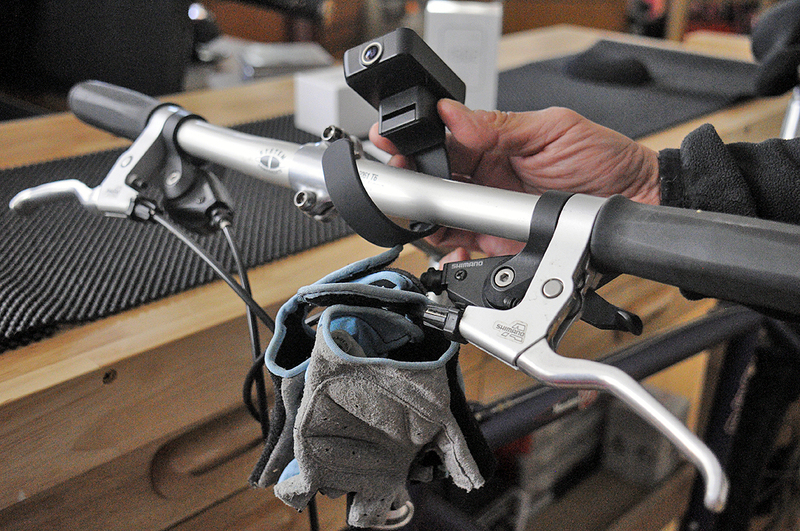 We found that while the bracket can be put onto the handle bar with the camera module already attached, it was easier to do it without. Pull the strap through and slide the end into the loop to secure it. Note that the strap is made of rubber and has a lot of grip so you don’t need to pull it very tight for it to stay in place. 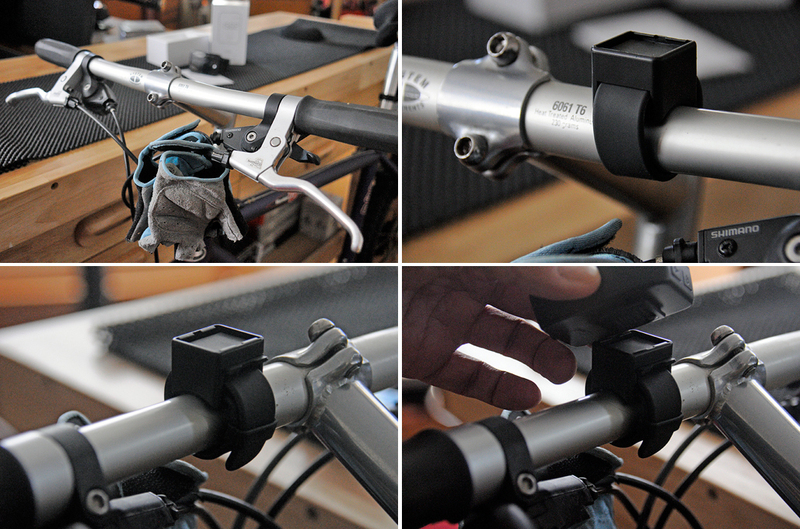 With the strap pushed through but before tucking it into the loop, click in the module and adjust as needed. Once everything is where you want it, pull the strap a little tighter to lock it down and tuck it into the loop so it is out of the way. Long time readers know we have had dash cams in our cars for close to three years now and have recorded a lot of “interesting” footage. We are eager to put one on our bikes and see if it will prove equally entertaining. We’ll let you know what we think of the MiniWing Camile once we have gone around Boston a bit with it. Look for the FirstUse writeup around the start of Summer.